NEW! Manc. Ctr. Guest House w/ Balcony & Mt. Views Minutes from Stratton & Brom. New! Private 1 bdrm, 1 bath, sleeps 3 apartment with mountain views and balcony! FULLY RENOVATED: Light, bright, & clean private guest house above 2.5 car garage with separate entrance, & private westward facing balcony with breathtaking mountain & sunset views of Mt. Equinox & Mt. Aeolus! This 650 square foot space is fully equipped with air conditioning, mudroom with washer & dryer, bathroom, bedroom, & open concept living room & full kitchen. Located 2 miles from shopping and dining in Manchester Center, 10 minutes from Bromley and Dorset, and 20 minutes from Stratton Mountain. The entire space was recently renovated (fresh paint, new bamboo floors, lighting, etc.) in 2017/2018. When you arrive, you’ll park on the paved driveway directly next to the private, newly constructed (December 2017), outdoor staircase. When you enter the guest house, you’ll find a hallway with mudroom to store you shoes, coats, and equipment in during your stay. There is a washer and dryer available for use. There is a private bedroom with a queen bed and fresh, cozy linens, night stand, bench, closet for storage, and blackout curtains to make sure you have a great night's sleep! There is a private full bathroom with shower/tub, toilet, and sink with clean towels for guest use. The open concept living room and full kitchen look out on the balcony and nearby mountains. The living room has a cozy sectional, flat screen smart TV with dish, and an ottoman with a pull out cot sized bed (perfect for children). The kitchen is equipped with a gas stove, microwave, dishwasher, refrigerator, sink, Keurig, dishware, glasses and mugs, cookware, and accessories. Dine in or eat out in nearby Manchester! Guest Access: Guest have full access of the guest house (above 2.5 car garage), private entrance and balcony, and nearby walking, running, and cross-country ski trails. We live in the main house (completely separate from the (guest house) and will be available if you need anything or if you have any questions. 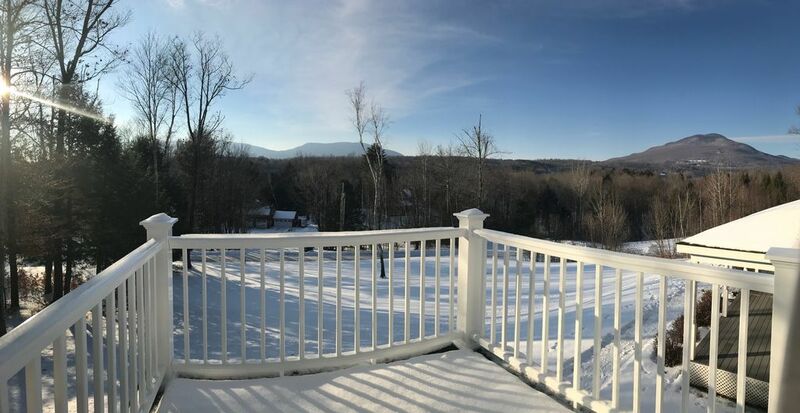 Set in a quiet neighborhood on a dead end road in the Green Mountain Forest, you'll be surrounded by peaceful trees and beautiful mountain views. For the outdoor enthusiasts, there are walking, running, and cross-country ski trails just outside and the location easily accessible to other local trails and golf courses! Take the short 2 mile drive into Manchester Center to explore shops, arts, and restaurants, 10 minute drive to Bromley Mountain Ski and Summer Adventure Park, 12 minute drive to the Vermont Summer Festival Horse Show in Dorset, and 20 minute drive to Stratton Mountain for skiing, festivals and events, shops, and restaurants. Okemo and Magic Mountain are a quick 40 minute drive. -Arrival: Check-in time is after 3:00 PM. Please use the keypad with code that we will provide after booking is confirmed. -Hosts live on the property in the main house with no shared walls, or inside access to the guest house. Departure: Please check out by 12:00 PM (noon). House Rules: We are so excited to share our home and our community with you! Please treat the property as you would your own home. - Dog (puppy) lives in the main house. - Must be able to climb stairs to access the guest house (above 2.5 car garage). We will ensure that the stairs are shoveled and salted as necessary. My husband, Sam, and I are newly married, young professionals living and loving life in the great state of Vermont! We're New York and Massachusetts natives and enjoyed ski trips to Vermont throughout our childhood and adult lives. When career opportunities brought us to Vermont, we dove in head first! If we're not traveling, on the weekends you'll find us skiing, hiking, fly fishing, golfing, running, enjoying the great VT Craft Beer scene, and spending time with our adorable English Springer Spaniel puppy, Gus! toilet, combination tub/shower, Bathroom includes sink and mirror. Freshly painted bathroom with new toilet and light fixture! The bathroom has a shower/tub, sink, mirrors, and has towel racks/hooks to hang your damp towels. Fresh towels and complimentary shampoo, conditioner, and body wash included. A hair dryer is also available for use. Fresh and clean bed linens are provided for the queen bed in the bedroom and for the pull-out cot sized bed. Kitchen linens are also provided. Located in the mudroom with complimentary detergent for guest use. Located in the mudroom with complimentary dryer sheets for guest use. Free on-premise parking located directly next to the apartment stairway entrance. Fresh and clean hand, body, and kitchen towels are provided. Wash cloths are also provided. Open concept kitchen and living room looks out on private balcony and mountain views. The living room includes a cozy sectional, pull-out twin bed ottoman, and smart TV with dish cable. New full sized refrigerator and freezer! Keurig coffee maker with complimentary coffee pods included. Paper towels, EVOO, salt, pepper, napkins, freezer/storage bags, tin foil, parchment paper,, and plastic wrap included. Fully stocked kitchen with tea kettle, dishware, glassware, silverware, bottle opener, utensils, and cookware included. Full kitchen with gas stove, microwave, sink, dishwasher, new refrigerator, and seating for two. The kitchen is equipped with dishware, cookware, Keurig, and complimentary coffee, tea, and cocoa. The open concept kitchen and living room has seating for two overlooking the private balcony and mountain views! Smart, 42" flat-screen television is located in the living room. Books are located in the TV console. Playing cards are located in the TV console. Private, beautiful balcony with westward facing mountain views of Mount Equinox and Mount Aeolus! The sunrise view is also stunning! Located near the Battenkill River and other great kayaking/canoeing and fly fishing locations! Great biking trails nearby! Visit bikemanchestervt.com for more details! Apartment entrance staircase has a small deck overlooking the backyard. The deck does not have patio furniture. Close to many ski destinations! Bromley is 10, Stratton is 20, and Magic and Okemo, 40-45 minutes away, and Mt. Snow and Killington are an hour away! Nearby Tennis Courts can be found at the Manchester Country Club (5 minutes away) and The Equinox Golf Resort & Spa (10 minutes away). Centrally located to many great courses! Manchester CC is 5, The Golf Club at Equinox and Ekwanok CC are 10, Dorset Field Club is 15, and Stratton Mt. Golf Course is 20 minutes away. This apartment is located on the second floor accessible by stairs only. There is no elevator. We will give you your space and total privacy but, are available if you have any questions or if you need anything prior or during your stay! A really good place for visiting Manchester and the Green Mountains of Vermont. Everything in the accommodation works well. The accommodation was very clean, the queen size bed is extremely comfortable and the shower powerful. Laundry facilities are good and coffee and tea was a welcome bonus. Location is great and the place is very clean, quiet, and super comfortable. I’ll definitely be back. Highly recommend. So much to say about this treasure nestled in the mountains of southern Vermont! The hosts were amazing! Very friendly, quick to answer questions, helpful, welcoming. So much attention to detail in this spacious 1 bedroom. Many comforts of home. Beautiful finishes, flooring, great kitchen, two incredible decks, and views that make you slow down and enjoy a second cup of coffee. We would absolutely book this charmer again. Just lovely! Great Residence In A Centralized Location! The property was roomy, beautiful, clean, and well appointed. The location was convenient and central to everything, such as Stratton, Bromley, and downtown Manchester. The owners provided an excellent information package on local attraction, restaurants, and were extremely responsive. We highly recommend this property and look forward to booking again for our next trip to Stratton Mtn / Manchester, VT.